A gorgeous volume celebrating the personal styles of dynamic creatives, revealing how inspirations translate to the canvas that is home. 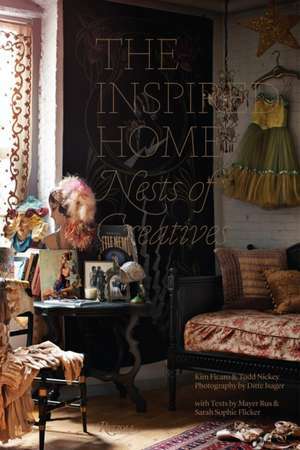 It is said that a house is a place to dwell, but a home is a space of creation and inspiration. The Inspired Home opens the doors to masterful spaces of celebrated musicians, stylists, writers, producers, designers, and tastemakers. With styles that vary from bohemian modern to beach chic, each space artfully reflects how to live well among one's passions and histories. The immaculate, mostly glass home of Athena and Victor Calderone in Amagansett, New York, is an inviting sanctuary; musician Moby's historical Hollywood Hills mansion is a collection of mid-century modern pieces and quirky collections; and Danish fashion designer Mads and Cecilie Norgaard's houseboat on the Baltic Sea is a haven of art, books, and gorgeous light. Homes from Italy, Los Angeles, New York, Copenhagen, and beyond leave the reader thoroughly inspired to live with what you love creatively. Exquisitely photographed, this vivid book is a must for anyone who loves sophisticated and whimsical living and artful interiors. Kim Ficaro is a New York based prop and interior stylist. She was style editor at "Domino" magazine. Since then she has continued to style for publications including "Bon Appetit," "Town and Country," and "Elle." Todd Nickey is a Los Angeles-based interior designer and co-owner of Nickey Kehoe Inc. Ditte Isager is a photographer who resides in Copenhagen and New York. Her clients and projects include Noma, Toast, H&M, and "Bon Appetit." Mayer Rus is the West Coast editor of "Architectural Digest." Sarah Sophie Flicker is a filmmaker, and performer, and the cofounder of the Citizens Band.